In the copper ore crushing plant, the big raw copper ore are fed to the jaw copper ore crusher evenly and gradually by vibrating feeder through a hopper for the primary copper ore crushing. After being separated, the crushed copper ore parts that can meet standard will be taken away as final products. After first crushing, the material will transferred to impact copper ore crusher or cone copper ore crusher by belt conveyor for secondary crushing. Then the crushed materials transferred to vibrating screen for separating. Final copper ore products will be taken away, while the other copper ore parts will be returned to impact copper ore crusher, thus forming a closed circuit. 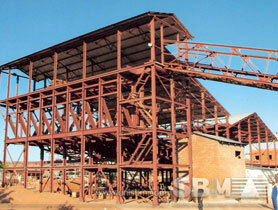 Size of final copper ore products can be combined and graded according to customer's requirement. We can also equip dust catcher system to protect environment. As a copper crushers manufacturer in China, SBM can offer jaw crusher used as copper ore crusher, impact crusher for secondary crushing, cone crusher and grinding mill for fine crushing. SBM has been built the copper ore crushing plant in Indonesia, Canada, Zimbabwe, Turkey, Chile, Zambia, Philippines, USA, Tanzania, Nigeria, South Africa, Iran, Pakistan, UK and New Zealand. "The servie from SBM including installation, maintenance and 24X7 on onlie servie makes us relived to use their products."